So you like the original Raging Form Dragon? Well he just came back after doing 100 Push-Ups, 100 Squats, 100 Sit-Ups and ran 10 Kilometers for an entire year. AUTO [V] LB4: [CB1, SB1, choose 2 grade 3 <Abyss Dragon> from your hand and discard them, choose 2 of your rear-guards and retire them] At the end of the battle this unit attacked, if you have a “Raging” heart card, you may pay the cost. If you do, put this G-Unit in the G-Zone face up, choose 1 face down “True Revenger, Raging Rapt Dragon” from your G-Zone, Stride it to V at Stand, and it gets Drive -1 until end of turn. AUTO [R]: When this unit attacks a vanguard, if you have a vanguard with “Raging” in its card name, this unit gets Power +2000 until end of battle, and “AUTO [R]: [CB1, retire this unit] At the end of your turn, you may pay the cost. If you do, search your deck for up to 1 <Abyss Dragon> with ‘LB4’, reveal it, add it to your hand, and shuffle your deck.” until end of turn. [AUTO](VC) Limit Break 4:[Choose three of your rear-guards with “Revenger” in its card name, and retire them] At the end of the battle that this unit attacked, you may pay the cost. If you do, choose up to one card named “Revenger, Raging Form Dragon” from your hand, ride it as [Stand], and choose your vanguard, and that unit gets [Power]+10000 until end of turn. [AUTO](VC):[Counter Blast (1)] When this unit attacks, you may pay the cost. If you do, this unit gets [Power]+3000 until end of that battle. For Today’s Card, we’re introducing the following from the 9th Booster Pack “Divine Dragon Caper” (on sale November 11th, 2016): New “Revenger” cards for 《Shadow Paladin》, “True Revenger, Raging Rapt Dragon” and “Revenger, Detonate Heat Dragon”, along with a special reprint of “Revenger, Raging Form Dragon”. The super popular card “Revenger, Raging Form Dragon” has powered up, reappears in “Divine Dragon Caper” as “True Revenger, Raging Rapt Dragon”! Its surprising ability should remind you of “Revenger, Raging Form Dragon”! After attacking “True Revenger, Raging Rapt Dragon”, you can pay the cost, the return “Raging Rapt” to your G Zone face-up, and then you’ll be able to Stride another “Raging Rapt” at Stand! You can attack again except with Twin Drive. As long as you can pay the cost, you can keep Striding to Attack again and again! Of corse the cost are Grade 3 〈Abyss Dragon〉s, so cards like “Revenger of Vigor, Maur” help you secure the cost, allowing you to seize victory via consecutive attacks. 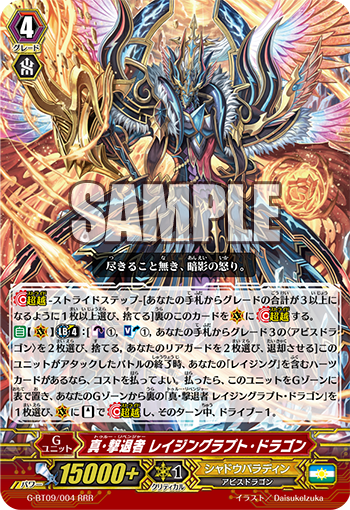 As well, the vital Heart Card “Revenger, Raging Form Dragon” also has a special reprinting in “Divine Dragon Caper” with a new illustration. “Revenger, Detonate Heat Dragon” is a Support Card for “Raging”! When it attacks a Vanguard, its Power rises to 11000! And when your turn ends, it can Retire itself to add an 〈Abyss Dragon〉 with 【Limit Break 4】 from your Deck to your hand. By adding “Revenger, Raging Form Dragon” to your hand, you can secure the cost of “True Revenger, Raging Rapt Dragon”. With these cards that strengthen “Revengers”, you can enhance your existing Decks! Other popular Units from the pas tappear once more, so keep an eye on Booster Pack “Divine Dragon Caper” in the future! !